Munchkin Soap Dispensing Bottle Brush button makes cleaning easy and convenient. 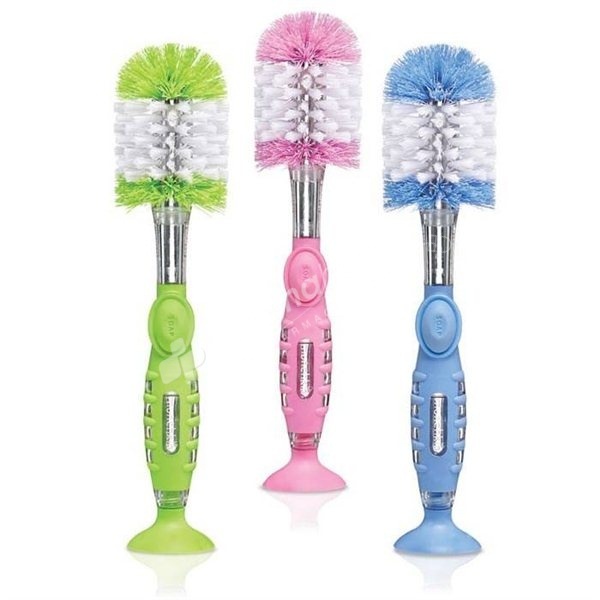 Durable scrubbing bristles reach hard-to-clean areas. Strong suction base holds the brush upright away from germs. Top rack dishwasher safe. Cleaning feeding bottles has become easier with Munchkin Soap Dispensing Bottle Brush. Just a push of a button releases soap for cleaning bottles. It lets you manage cleaning with simple one-hand operation with the combined benefits of soap and a brush. This brush can also clean hard-to-reach areas of bottles. Nylon bristles are durable and scratch-free. Why You'll Love It: Munchkin Soap Dispensing Bottle Brush has a sturdy suction base that grips tightly and keeps this brush in an upright position for effective cleaning. One touch soap release button.